LATEST: OSHA extends crane operator certification comment period to July 5, 2018. U.S. Secretary of Labor R. Alexander Acosta recorded Public Service Announcements to address the increase in preventable trenching- related fatalities. Recorded in both English and Spanish, the PSAs highlight effective ways to stay safe when working around trenches or excavations. Additional information on trenching hazards and solutions is available on OSHA’s trenching and excavation webpage. OSHA’s newly revised “Protect Workers in Trenches” poster provides a quick reminder of the three ways to prevent dangerous trench collapses: SLOPE or bench trench walls, SHORE trench walls with supports, or SHIELD trench walls with trench boxes. The poster is available in English and Spanish. OSHA issued a memorandum outlining initial enforcement of the standard for respirable crystalline silica in general industry and maritime. Most provisions of the standard become enforceable June 23. The standard establishes a new 8-hour, time-weighted average permissible exposure limit and action level. During the first 30 days of enforcement, OSHA will offer compliance assistance for employers who make good faith efforts to comply with the new standard. OSHA plans to issue interim enforcement guidance until a compliance directive on the new standard is finalized. For more information, read the news release. With Independence Day celebrations approaching, OSHA is encouraging the fireworks and pyrotechnics industry to protect workers from hazards while manufacturing, storing, transporting, displaying, and selling fireworks. OSHA offers information on common hazards and solutions, including safety posters for workplaces. The U.S. Court of Appeals for the First Circuit ordered Maine roofing contractor Stephen Lessard, to implement a comprehensive safety and training program and pay $389,685 in outstanding OSHA fines for repeatedly exposing workers to falls. His roofing and construction companies were cited for safety violations at 11 different work sites in Maine between 2000 and 2011. The contractor was also ordered to ensure that workers use required safety equipment and fall protection; employ a competent person to ensure that work is performed according to OSHA regulations; and submit certification that cited hazards have been abated. For more information, read the news release. Springfield Power, LLC, was cited for 25 safety violations after an employee suffered fatal injuries from being pulled into a conveyor. Inspectors found that the company failed to: provide machine guarding; train employees on how to prevent unintentional equipment start-up; and establish adequate emergency evacuation, fire prevention, and hazardous energy control programs. The New Jersey-based company faces $125,460 in penalties. Read the news release for more information. Roofing contractor Hector Hernandez was cited for one repeated violation and two willful violations for failing to provide fall protection, train workers on fall hazards, properly install an extension ladder for safe exit, and provide required ladder jack scaffold components. Proposed penalties are $120,320. For more information, read the news release. Chemical manufacturer EnviroTech Services, Inc., was fined $64,857 after a worker was fatally injured due to lack of oxygen while cleaning the inside of a railcar. OSHA issued citations for failing to provide respiratory protection, comply with confined space requirements, and develop an emergency rescue plan. Read the news release for more information. California OSHA issued six citations and $48,095 in penalties to Tobin Steel Company, Inc., after a worker sustained serious injuries while operating an unguarded press brake machine. Inspectors concluded that the company failed to: conduct and document required inspections; test and maintain power-operated presses; train workers on amputation hazards; and provide adequate machine guarding. Minnesota OSHA issued eight citations and $366,150 in penalties to Gateway Building Systems, Inc., after a worker suffered a fatal fall from a grain elevator. Inspectors determined that the company failed to: ensure workers were using correct anchorage points; install proper decking and guarding over an expanded platform; and provide overhead protection for workers. 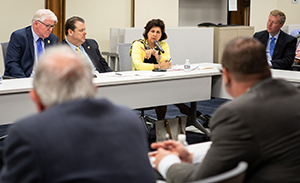 On June 12, OSHA held its first Whistleblower Protection Program Stakeholder Meeting, focusing on the railroad and trucking industries. Deputy Assistant Secretary Loren Sweatt (not pictured) welcomed transportation stakeholders, who presented comments and suggestions on how the agency can better deliver whistleblower customer service. This meeting was the first in a series of meetings requesting public input on the Whistleblower Protection Program. The National Safety Council (NSC), one of the Safe + Sound Campaign organizers, designates each June as National Safety Month to focus on reducing leading causes of injuries and fatalities at work, on the road, and at home. NSC offers free resources to help ensure that “No 1 Gets Hurt” on the job or at home, and is hosting a free June 19 webinar, Building a Culture of Safety from the Ground Up, on how to create an effective workplace safety and health program. On June 12, forklift manufacturers across the country participated in National Forklift Safety Day, an annual event sponsored by the Industrial Truck Association (ITA), a longtime OSHA Alliance Partner. In Washington, D.C., OSHA Deputy Assistant Secretary Loren Sweatt addressed ITA members and others to emphasize the importance of incorporating safety into work practices every day and training those who work with or around forklifts. Information on safe forklift operation is available in a new OSHA QuickCard with tips on how to avoid common hazards associated with forklift operations. As a participant in OSHA’s National Safety Stand-Down to Prevent Falls, ladder manufacturer Werner Co. held more than 200 events that provided fall protection and ladder safety training to more than 34,000 workers across the United States and Canada. Recently, two Miami workers who received training were saved from a fatal fall while inspecting a high-rise building. The workers were wearing personal fall arrest systems when the suspended scaffold they were on collapsed. 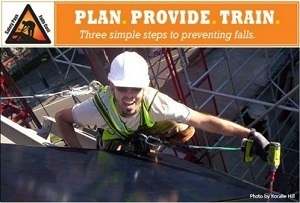 For more information on preventing falls, visit the Fall Prevention webpage. 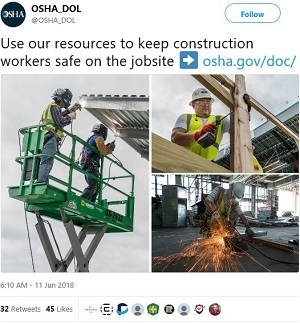 Following a major incident at its South Beloit, Ill., facility, Mid-States Concrete Industries contacted OSHA’s free On-Site Consultation Program. The company proactively requested annual workplace safety and health reviews by OSHA consultants, and worked with an employee safety committee, union safety officers, and trainers to help maintain a high safety standard. Since its first consultation, Mid-States Concrete experienced a nearly 90 percent drop in its recordable injury case rate, resulting in an 80 percent drop in workers’ compensation costs. The company was then approved to participate in OSHA’s Safety and Health Achievement Recognition Program. For more information, read the success story. Veolia Schenectady, a waste transportation and storage site in New York, earned Merit recognition in OSHA’s Voluntary Protection Programs (VPP) for measures it instituted, such as a program for reporting near-miss events and safety suggestions, corporate-wide safety alerts about incidents at other facilities, and a computer system to provide field technicians and warehouse employees with information on the chemicals at each customer site. For VPP Merit participation, employers must demonstrate an exemplary commitment to the safety and health of their employees by working with them to develop and maintaining a comprehensive and effective safety and health program. OSHA and Gilbane Construction Company signed a partnership agreement to protect 250 workers during the renovation of the Connecticut State Office Building and parking garage in Hartford. The partnership will encourage involvement of general contractors and sub-contractors to enhance safety and health practices. The Strategic Partnership Program provides opportunities for OSHA to partner with employers, workers, professional or trade associations, labor organizations, and other interested stakeholders to create safe and healthful work environments. The Griffin Hospital Occupational Medicine Center renewed a two-year agreement to provide guidance and training resources on topics such as recordkeeping, hearing conservation, lockout/tagout, machine guarding, and bloodborne pathogens to businesses in the Greater Naugatuck Valley Area of Connecticut. The Home Builders and Remodelers Association of Cape Cod, Inc. signed a two-year agreement to prevent exposure to residential construction hazards, such as falls, nail guns, and silica. The Yale Occupational and Environmental Medicine Program signed a two-year agreement to provide medical fellows and residents with guidance and training on acute and chronic occupational health hazards and chemical exposures, and understanding worker protections under the Occupational Safety and Health Act. For organizations participating in Safe + Sound Week August 13-19, there are many free resources to help plan activities and promote events. 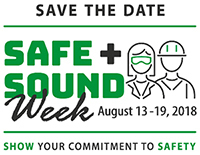 The Safe + Sound Week website offers a variety of activities, each focused on one of the three core elements of a successful safety and health program: management leadership, worker participation, and finding and fixing hazards. Employers can also use these customizable tools to promote their safety events. OSHA’s new Occupational Chemical Database compiles information from several government agencies and organizations into one online resource. The webpage includes chemical identification and physical properties, permissible exposure limits (PELs), and sampling information. Chemicals can be searched by name or identification number, or grouped by PEL, carcinogenic level, or whether they pose an immediate threat when inhaled.